Craters are circular depressions in the landscape produced by meteor impact or volcanic process. A volcano crater is more properly referred to as a caldera. It is not uncommon for calderas to fill with water after the volcano becomes inactive. Craters appear on the surface of the Earth and other solid planets as well as their moons. 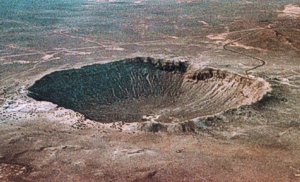 On Earth, one of the most famous craters is the Barringer Meteorite Crater ( pictured left ).